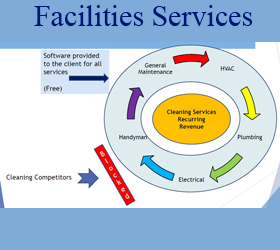 The franchise offers complete facility services for small, medium, and large facilities. They can provide over 20 services. B2B "one stop" for the client for all requirements. This is a recurring model with a marketing and business model differentiator. They only sell one franchise per metro area. They provide a level of strong technology that makes this a unique offering in the market place. Customers include: Lawyers Offices, Medical Offices, Auto Dealerships, Churches, Stores, Fitness Centers, Daycare Centers, Government Facilities, Movie Theaters, Restaurants and Schools. No students or brokers please. Interested buyers must have a minimum net worth of $250K. The information contained in this ad does not constitute an offer to sell or award a franchise. Such an offer can only be made in compliance with applicable disclosure laws and a Franchise Disclosure Document. Check for current pricing and availability. Affordable Business Concepts, LLC does not make any guarantees or declarations regarding earnings. Buyer must be a US Citizen. Exclusive Territory covers all of Metro area. Low Overhead, no real estate. Can work from your home office. As a one stop shop for many services, the client has a compelling reason to contract with this franchise for ease of facility management and cost reduction. Client software allows for quick and easy facilities issue notivication and correction. Proprietary software is also helpful in the sales process. Scalable business, easy to grow by adding accounts and staff. Strong marketing programs include an online web strategy, direct and bulk mailing, national accounts. We can introduce you to franchise friendly lenders. We refer you to unlock your IRA or 401K plan without penalties . We can also get you SBA Pre-Qualified in about 24 hours after application with no cost or obligation. Price listed varies based on population. The franchise offers exceptional training and ongoing support. Phone support, Montly visits, Online support and annual group meeting. This is an Existing Franchise for resale by the Franchisee. Contact ABC to check for current pricing and availability. Affordable Business Concepts, LLC does not make any guarantees or declarations regarding earnings. The information contained in this ad does not constitute an offer to sell or award a franchise and may not reflect the most current facts. Such an offer can only be made in compliance with applicable disclosure laws. Offerings are made by Franchise Disclosure Document only.